The Milwaukee Brewers have picked up the 2015-options on pitcher Yovani Gallardo and third-baseman Aramis Ramirez but declined to pick up the $11.5 million option on second baseman Rickie Weeks. The Brewers have no viable option at third base besides Ramirez so they picked up their half of the $14 million mutual option. Ramirez has three days to accept or decline. Gallardo finished 8-11 in 2014 but had a career best 3.51 ERA over 32 starts. He allowed 195 hits, issued 54 walks and struck out 146 hitters in 192 1/3 innings. It’s his first losing record with the Brewers. The Milwaukee Brewers needed a strong road trip just to have a chance to stay in playoff contention. They wrapped up the nine-game trip with a 3-6 record after Thursday’s 5-3 loss to the Cincinnati Reds. The result eliminated the Brewers from playoff contention, which means they’ll play three meaningless games at Miller Park to close out the season against the Chicago Cubs. Following a 10-1 victory against San Diego on Aug. 25, the Brewers had a 1 1/2 game lead on the St.Louis Cardinals atop the Central Division and six games over Pittsburgh. Since then, the Brewers went 8-20 to fall out of the playoff picture. After leading the National League Central for 150 days, the Brewers now have to win one of their three games against the Cubs this weekend to guarantee a winning record. The Brewers committed three errors that led to a pair of unearned runs for Cincinnati. The sloppy play also led Yovani Gallardo to lose for the eleventh (8-11) time this season, despite a 3.51 ERA. Brandon Phillips clubbed a two-run homer for the Reds to push their lead to 5-2 at the time. Rickie Weeks homered in the loss for the Brewers. Jimmy Nelson (2-8, 4.57) pitches the series opener against the Cubs tonight. Eric Jokisch (0-0, 1.74) goes for Chicago. The Milwaukee Brewers stayed alive in the NL wildcard picture for another day, blanking the Cincinnati Reds 5-0 at Great American Ballpark. The win, along with the Giants 9-1 loss to the Los Angeles Dodgers, allowed the Brewers to avoid playoff elimination for at least one more day. The Brewers trail the Giants by four games, with four left to play. The Brewers need to win all four of their remaining games and get the Giants to lose all four of their games, just to force a 0ne-game matchup for the right to a wild card spot. The Brewers close out their series at Cincinnati today, then host the Chicago Cubs for a three-game season ending series at Miller Park this weekend. The Giants open a 4-game series with division rival San Diego. 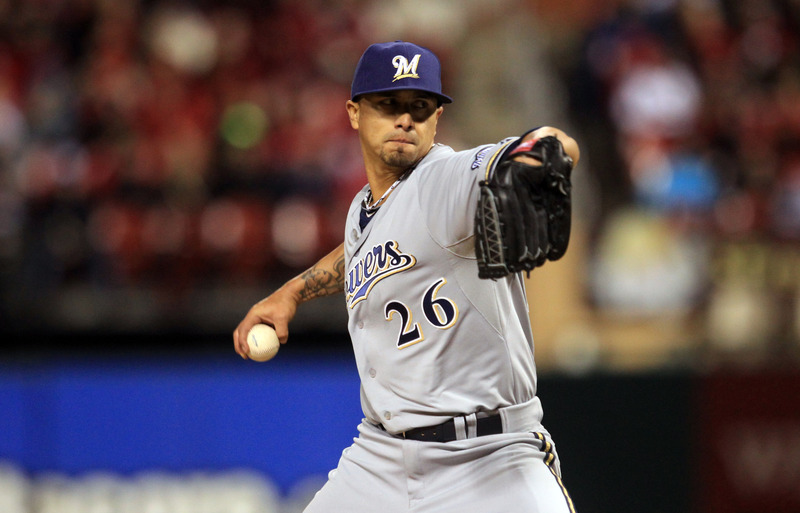 Kyle Lohse went the distance, tossing a 2-hit, complete game shutout for the Brewers. He struck out six, with no walks. Cincinnati pitchers also did their best to help the Brewers by walking 10 hitters. During the first eight games of the road trip, Brewer starting pitchers have combined for a 1.17 ERA. Second baseman Rickie Weeks led the Brewers offensively, going 2 for 3 with a walk. Jean Segura doubled home two runs in the 8th inning. Yovani Gallardo (8-10, 3.46) pitches the series finale for the Brewers today. David Holmberg (1-2, 5.25) pitches for the Reds today (11:35am). Things were looking grim for the Milwaukee Brewers, trailing the Los Angeles Dodgers 2-0 heading to the 8th. They they broke it open with five runs and went on to beat the Dodgers 6-3. The Brewers started their rally against Dodgers reliever Jamey Wright, who pitched for the Brewers back in 2001. Ryan Braun and Aramis Ramirez singled before Scooter Gennett added a runs coring single. Khris Davis then tied the game with a double in right-center. After an intentional walk to Mark Reynolds, Brandon League came in to strike out pinch-hitter Rickie Weeks. With two outs and the bases loaded, Lyle Overbay emptied the bases with a three-run double to left. Rookie Jimmy Nelson didn’t get the win, but he did give the Brewers a chance to win, holding the Dodgers to two runs over six innings. Former Brewers pitcher Zach Greinke left after five shutout innings, holding the Brewers to just two hits. But Greinke had to exit with a high pitch count and he remains winless against his former team. Yasiel Puig had three hits and drove in two of the Dodgers runs in defeat. 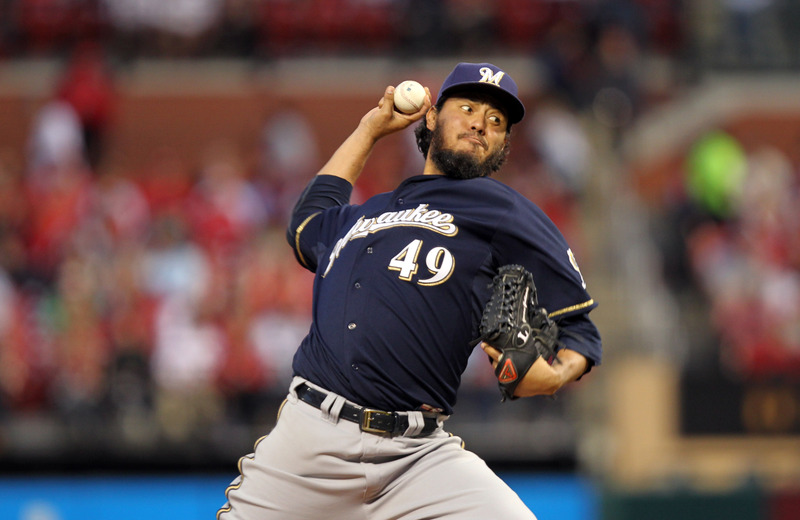 The Brewers send Yovani Gallardo to the mound in game two of the series tonight, against the Dodgers Clayton Kershaw. The Brewers stayed two games in front of the Cardinals atop the NL Central. Cubs starter Tsuyoshi Wada (2-1) was coasting until he was chased in the seventh, when he allowed back-t0-back home runs to Rickie Weeks and Martin Maldonado. Wada allowed two runs on five hits in 6 2/3 innings. He struck out five and walked one. Kyle Lohse (11-7) allowed four runs on seven hits in three innings, and tweaked his right ankle during an at-bat. It was the shortest outing of the season. Lohse’s injury isn’t believed to be serious, but it’s not certain whether or not he’ll be able to make his next start on Aug. 19 against Toronto. The Brewers can’t afford to lose another starter. They’re already without Matt Garza, who is on the 15-day disabled list with a strained oblique. Marco Estrada came on in relief of Lohse and held the Cubs down for four innings. He allowed two hits and struck out two. The Milwaukee Brewers and Los Angeles Dodgers series opener at Miller Park on Friday night started out as a pitching duel. But the Brewers poured it on late, scoring seven runs in the last two innings to pull out a 9-3 win. The Dodgers actually scored twice in he top of the 7th inning to take a 3-2 lead. But the Brewers rebounded with four in the bottom half and took over for good. Shortstop Justin Turner had two crucial errors for the Dodgers in that inning. It could have been three, had it not been for an official scorer’s decision to award a hit instead of an error. Rickie Weeks clubbed a three-run homer to cap off the scoring for the Brewers in the game. Kyle Lohse wasn’t involved in the decision, but he gave the Brewers six quality innings, allowing a run on six hits. The win goes to Jeremy Jeffress (1-1) in relief. Mike Fiers (0-1, 2.57) was called up from triple-A Nashville and will start tonight’s game against the Dodgers. L.A. goes with former Brewer Zach Greinke (12-7, 2.71). The Milwaukee Brewers got sloppy late in the game yesterday and fell to the Washington Nationals 5-4. Rickie Weeks had three hits, including a leadoff home run, Aramis Ramirez clubbed a 2-run shot and Scooter Gennett added a pinch hit two-run home run as the Milwaukee Brewers knocked off the Colorado Rockies 7-4. The Brewers swept the Rockies in Denver this week and added their 4th straight win against Colorado last night. Wily Peralta (9-5) allowed three straight singles in the fourth before Ryan Wheeler hit a grand slam that gave the Rockies a 4-3 lead. But Peralta settled down and the Brewers re-took the lead in the fifth. Rickie Weeks doubled and scored on Jonathan Lucroy’s single. A sacrifice fly by Khris Davis put the Brewers ahead 5-4. Scooter Gennett’s home run in the 8th gave the Brewers the final margin of victory. Peralta won his fifth consecutive start for the Brewers. He gave up four runs and eight hits in six innings. He struck out seven and walked two in his second win over the Rockies in less than a week. Francisco Rodriguez earned his major league-leading 26th save and the 330th of his career, tying him with John Wetteland for 12th on the all-time list. Kyle Lohse (9-2, 3.20) pitches game two of the series tonight against the Rockies Tyler Matzek (1-2, 5.19). Travis Wood pitched two-hit ball for seven innings and the Chicago Cubs got home runs from Wellington Castillo and Mike Olt in a 4-2 win over the Milwaukee Brewers on Sunday at Wrigley Field. The Brewers had the first shot at putting up some offense when Wood, after two were out in the first inning, walked three straight Brewer hitters. But Khris Davis came to the plate and swung at the first pitch and grounded into an inning ending fielders choice. Marco Estrada (3-2) pitched five innings, giving up four runs and seven hits, including the two Chicago home runs. Estrada has now given up 12 home runs in nine games this season. Estrada says he didn’t have a feel for his pitches, especially his changeup, which he left up on Castillo’s two-run homer in the second that gave the Cubs a 2-0 lead. The Cubs added a run in the third when Starlin Castro and Luis Valbuena hit back-to-back two-out doubles. In the Fourth inning, Olt clubbed his team-leading ninth home run of the season to make it 4-0. The Brewers scored their only run in the fifth inning. After Logan Schafer doubled, Rickie Weeks followed with a two-run homer to cut the Cubs lead in half. But the only other Brewer hit would come in the 9th when Ryan Braun would lead off with a double to right. Wood (4-4) allowed two runs and struck out seven to give the Cubs two wins in the three game series. The Brewers had been scoreless for 20 straight innings, since the second inning Friday, and struck out 39 times in the three game series. The Brewers have scored a total of 11 runs over the last five games. Wily Peralta pitches game one of series in Atlanta against the Braves tonight.